What images come to mind when thinking of 10 year old students? For some, loud, hyper, barely manageable, right? 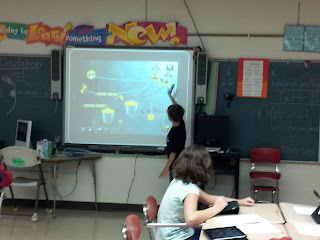 Tinkerbox app...you have captured my students' attention and ignited their imagination and passion for design! With 2 days before break, anyone visiting my room would be surprised at the very cool learning taking place. After break, we are heading into a VERY cool section of science involving LEGO Mindstorm NXT units. This will involve constructing the LEGO rovers, programming the rovers using computer programming, and completing various challenges similar to the challenges the real Mars rovers have faced. 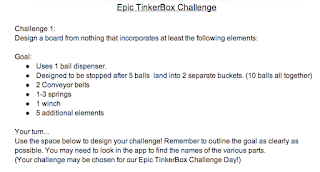 To prepare for these challenges, I loaded Tinkerbox and Cargo-Bot apps to our class iPads. Both apps involve elements in programming and problem solving. I had NO idea the interest that would develop. Several students used the Tinkerbox app one time in class and were hooked. Two students, Luke and Dawson, became so hooked on the app that they loaded the app to their devices at home and began building! 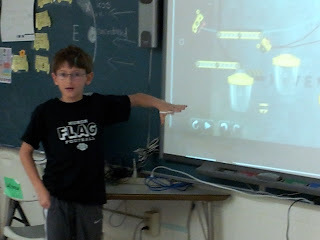 Both student emailed me their inventions. 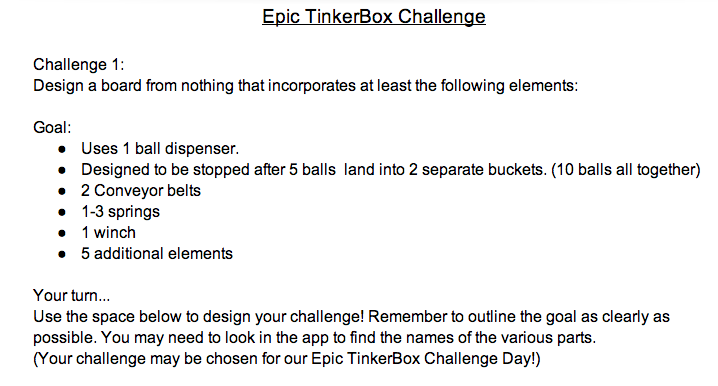 In our conversations, Luke and Dawson helped to map out an Epic Tinkerbox Challenge for the remaining students. I typed up the challenge, and today was the day to jump in. I allowed Luke to get our first science class rolling on it. I stepped back and watched Luke demo the project. 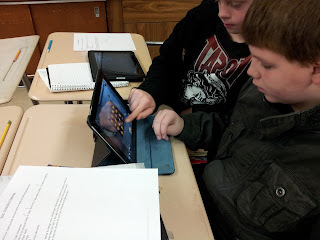 He mirrored his iPad to the computer, gave some pointers, rotated around the room to support other students, and continued to build while still projecting to the class. I think that I spoke MAYBE 3 times during the class. I had the BEST student teacher. "I tested it like a ton of times." Luke, in response to student questioning his building method. The conversations around the room were very, very cool! Problem solving, work ethic, science...check! And, transition to the LEGO rover investigations...check! I think Tinkerbox is a great app! I think Luke is a great teacher! 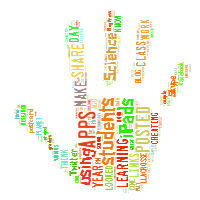 I think learning with students is great!